Christmas cards don’t always have to be perfect. Family photos are nice and a newsletter is grand but sometimes the process can be a little more stressful than the season can handle. 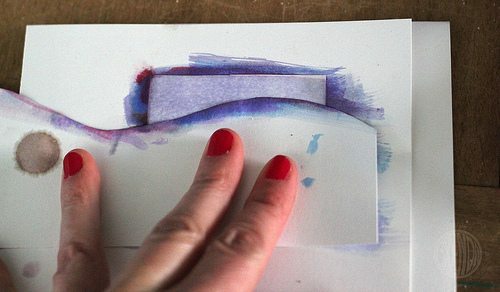 Personally, I think it’s fun to slow things down a little and create something beautiful and magical that you can enjoy while you’re doing it! 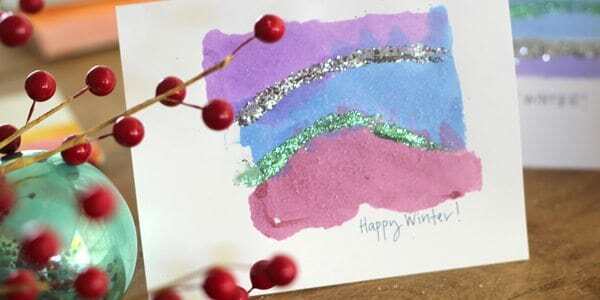 On a quiet afternoon we decided to make some wintry snow scenes using a little watercolor paint and some glitter. They aren’t realistic scenes. The lines are blurred and messy but if you squint your eyes just right, you can see a pretty snowy scene! I tried to make a window with another piece of cardstock too but it wasn’t all that effective. You can experiment with that idea if you like. 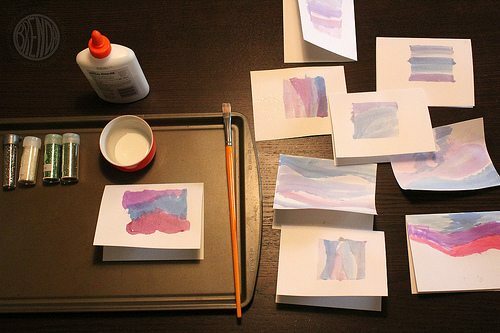 We painted and painted, trying to keep our colors soft with lots of water and very little paint. 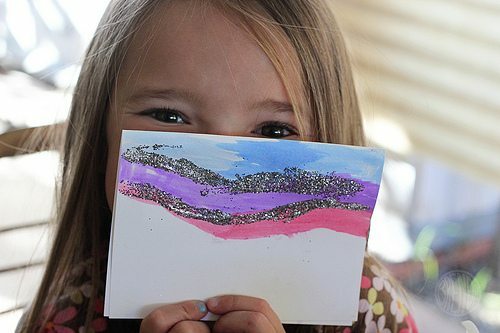 Of course my daughter had her own agenda and strayed from my wintry color palette of blues and purples but I let it go. 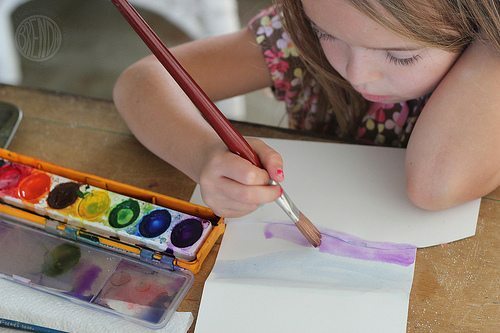 Art is more fun if you let kids do what they will do and try not to interfere too much in the process. We also added salt to the wet paint on a few. That always creates a fun effect. 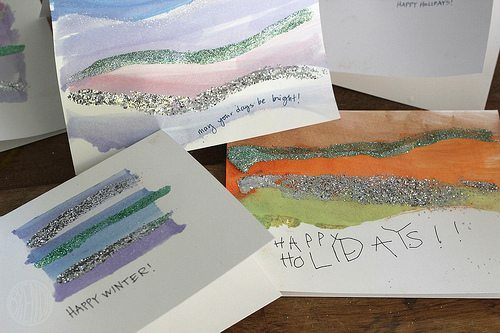 After we had painted dozens of cards we were ready to glitter! 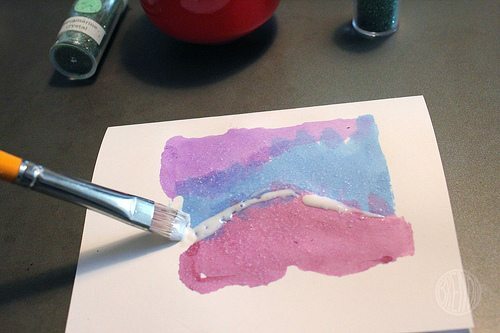 To add glitter to your snow scenes just paint a line of white glue along the curve of your mountains. 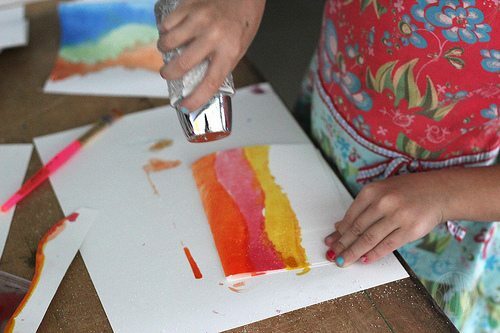 Then shake shake shake your groovy glitter all over the lines of glue! 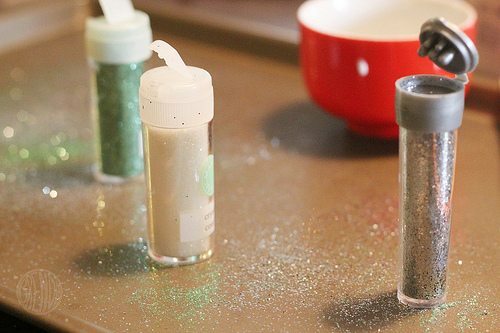 An easy way to keep glitter mess to a minimum is to work on a cookie sheet. 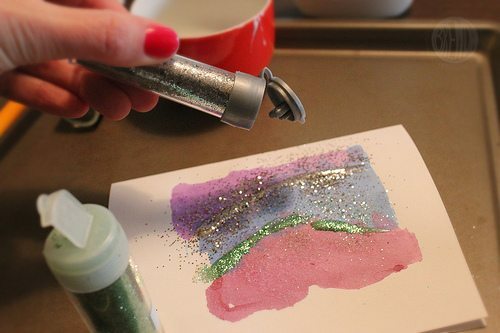 Then when you’re done you can slide all the excess glitter right back into its container and use it again next time! And when you’re done they are so pretty! Do you see the sparkling snow? No? Squint a little harder. Add a festive saying and you’re done! I know I’d smile if I got one of these in my mailbox. 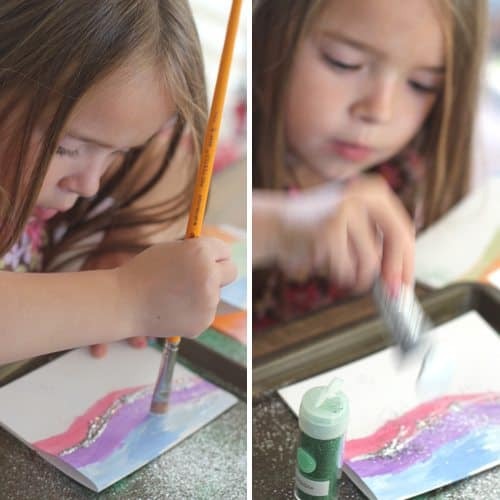 I can’t wait to try these with my daughter! Simple, beautiful and FUN! Im sure I have all the supplies to make these. Now I just need to remember the making them part. 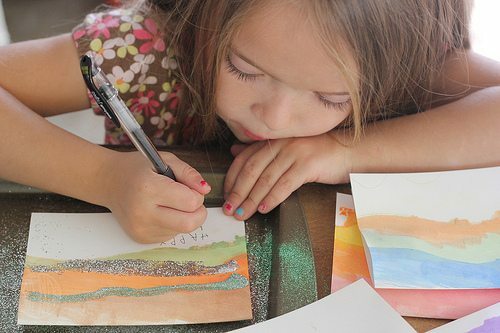 I love how these cards have a contemporary feel to them and are easy to make for little hands. So pretty! Seriously? Those are HIDEOUS. I don’t know what else to say but they are not your best work. They are sloppy looking & ugly.